Jewels from a state visit, a baptism, and a royal tour top this week's roundup. Enjoy! 10. While in Wellington during their royal tour of New Zealand, the Duke and Duchess of Cambridge unveiled a new portrait of Queen Elizabeth II. In the picture, she wears the same diamond fern leaf brooch that has been lent to Kate for the tour. While Kate didn't wear the brooch again for the unveiling, she did wear a custom Jenny Packham gown that featured fern leaf embroidery on one shoulder. 9. Plans for the celebration of Prince Henrik of Denmark's eightieth birthday have been announced. The official events include a gala performance at the concert hall in Copenhagen on June 1. In the past, these events have included major jewels, and I think we can expect some grand glitter on this occasion, too. 8. 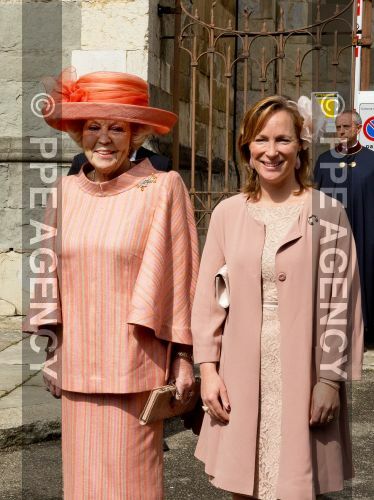 Members of the Dutch royal family gathered in Piacenza, Italy on Saturday for the baptism of Princess Cecilia of Bourbon-Parma, the second daughter of the Duke and Duchess of Parma. 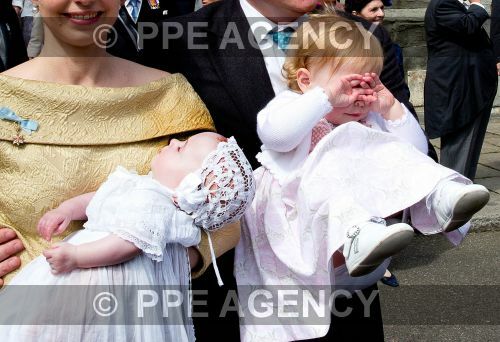 The Duke is the son of Princess Irene of the Netherlands, and the event brought out a number of royal ladies in jewels. Brooches were the popular jewelry item, worn by Princess Beatrix, Princess Margarita, Princess Viktoria, and Princess Irene (who also donned a pearl necklace and pearl and diamond earrings). 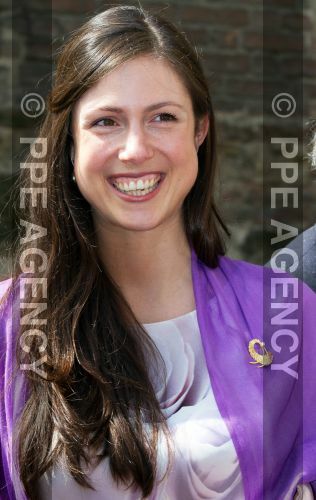 Additionally, the Duchess of Parma appears to have the badge of the Constantinian Order of St. George (which is worn suspended from a pale blue ribbon) pinned to her dress. The Bourbon-Parmas have had a mini baby boom of late, so we can expect to see a few more christenings in the near future. 7. After the majorly bejeweled first days of the Irish state visit to the United Kingdom, Queen Elizabeth II chose the Jardine Star Brooch for a reception at Windsor Castle on Thursday that brought together dignitaries from both the Republic of Ireland and Northern Ireland. 6. The traditional Guildhall Banquet held on the second day of state visits to Britain was held on Wednesday. The Queen's cousins tend to take on this particular event. For this banquet, the Duchess of Gloucester was resplendent in diamonds, wearing the Gloucester Honeysuckle Tiara in its all-diamond form, paired with a sparkling diamond necklace. 5. Saturday saw the second day of events marking the 400th anniversary of the diplomatic relationship between Sweden and the Netherlands. On the day, Queen Maxima wore hoop earrings and a striking crescent-shaped brooch, while Queen Silvia wore a strand of multi-colored pearls. 4. 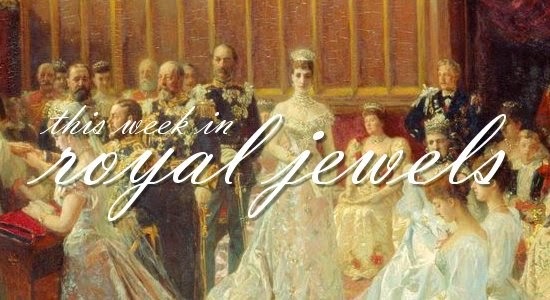 On Tuesday, we discussed jewels worn in a portrait by Grand Duchess Charlotte of Luxembourg here on the blog. Leave it to the ladies of Luxarazzi to do some extra digging to give us more information on one of the pieces. 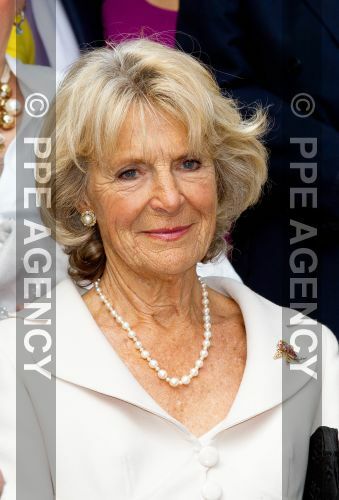 They've identified the drop pearls suspended from Charlotte's necklace as the same ones worn by Grand Duchess Maria Teresa on a brooch (seen above at National Day in 2010). The pearls can be traced back to Grand Duchess Maria-Ana, who was photographed in the pearls in 1921. 3. 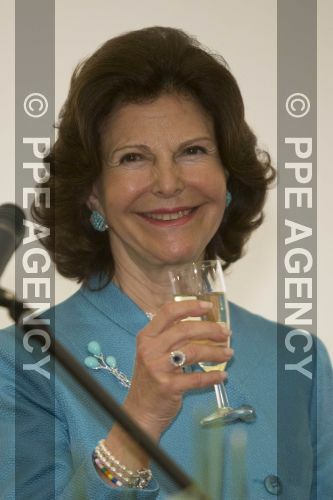 Queen Silvia of Sweden traveled to Germany this week, where she received the Friedenstein Award from the Gotha Cultural Foundation. She wore pearls, diamonds, and turquoises for the event, including a gorgeous turquoise and diamond brooch. 2. For the opening of a campus of buildings geared toward youth and education in Rotterdam, Queen Maxima again wore a striking pair of bright blue earrings. 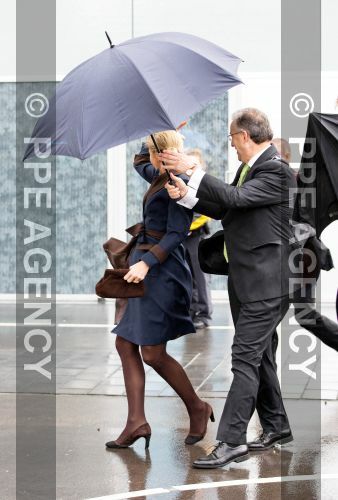 Unfortunately, her striking hat had a bit of trouble in heavy wind! 1. I mentioned this last week, but I think it's worth a reminder: if you love Faberge eggs, and you're in London, here's your chance to see one of the imperial examples up close. The recently-rediscovered Third Imperial Easter Egg will be on display at Wartski's in London from April 14-17. The press release I received gives 11 AM-5 PM as the exhibiting hours. If any of our London-based readers gets a chance to see it in person, be sure to drop by and share the experience with us!